Last year, the Pittsburgh Penguins overcame a myriad of injuries to waltz through the 2013-'14 regular season. They seemingly wrapped up the Metropolitan by Thanksgiving, ultimately finishing the campaign with a 13 point cushion over their nearest division rival. That group, however, represented anything but a complete team. It was an incredibly top-heavy squad, one that relied heavily on special teams to help overcome its deficiencies. But, when the stars and the power play went quiet against the Rangers, the season quickly unraveled as Pittsburgh blew a 3-1 series lead and another golden opportunity to come out of the Eastern Conference. With sweeping changes throughout the organization in the offseason and plenty of new faces in the lineup this year, though, the Penguins find themselves off to another great start. Time will tell how this season will play out or if all the new looks will pay off in the postseason but, early on, we're already seeing signs that this year's squad has changed for the better. Last year, Pittsburgh didn't possess many formulas for success. If the power play wasn't clicking or the stars weren't producing, the Pens typically found themselves in for a long night. In looking at a quick snapshot of the season to this point, things may not appear all that much different. After all, the Penguins find themselves in familiar territory, boasting the circuit's top power play (32.8%). What's more, Sidney Crosby and Evgeni Malkin have figured in on 43% and 33%, respectively, of Pittsburgh's 58 total tallies. Dig a little deeper, though, and you'll find more layers contributing to the Penguins' success. Someone or some group always seems to step up to make a difference. When the penalty killing unit struggled out of the gate, the Pens flexed their offensive muscle, simply outscoring the majority of their opponents. When even strength production stalled, the man advantage carried the load. Now that the power play has cooled off, the Penguins are scoring more five-on-five. When the big guns get bottled up, solid goaltending and the bottom-six step up and lead the way. And, if the trend continues, if Pittsburgh can keep exploiting opponents in a variety of manners, it will go along way toward making these Penguins more difficult to play against in the playoffs. It's no secret that last year's bottom-six consisted mostly of fringe NHL talent and AHL call-ups. In fact, outside of Brandon Sutter (26), no one in the group put up more than 17 points. Not only did the they struggle to chip in offensively but, more often than not, the third and fourth lines found themselves overwhelmed, struggling to even escape from their own end of the ice. Fast forward to this year, though, and it's a different story. In bringing back Brandon Sutter and Marcel Goc, G.M. Jim Rutherford ensured his club would possess solid depth at the center position. But it was an influx of wingers that helped to truly reshape the group. 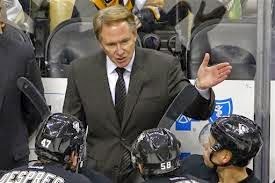 The additions of Blake Comeau, Steve Downie and Nick Spaling provide Mike Johnston with the kind of versatility the Penguins didn't enjoy last year. All would ideally join Sutter, Goc and Beau Bennett to help round out the bottom-six but simultaneously provide the potential to fill in alongside either Sidney Crosby or Evgeni Malkin. And, to this point, the Penguins are certainly benefitting from the upgrades. Both Sutter and Comeau may actually flirt with career highs in terms of goal/point production while Downie and Spaling figure to provide the Pens with another pair of 20-point producers. Throw in the fact that Bennett recently rejoined the third line after missing the start of the season and whatever upgrades Rutherford may have in store for the playoff push and Pittsburgh figures to enter the postseason with significantly more depth up front than they possessed last year. It starts with a new system, a philosophy that plays to the strengths of one of the NHL's most skilled clubs. Gone are the stretch passes and flat-footed forwards that awaited them. In their place, a new way of thinking allows for an actual unit to break out together. And, as a result, Pens' fans will find Crosby flying through the neutral zone and attacking with speed, Malkin swooping back in his own end before galloping up ice and Kris Letang more effectively transitioning from offense to defense. Playing with more of a pack mentality, the Penguins are using their speed and skill to help drive possession, to control play and to dominate opponents. They're throwing more pucks on net and when they do, guys like Patric Hornqvist are going to the net and creating havoc around opposing goaltenders. And, it's hard to argue with the results to this point, as the team sits at a league-best +25 goal differential. But it's not just about a new a breakout or creating more traffic around the opposition's net. No, this year, this Pittsburgh team is physically more difficult to play against. From a previously missing element now provided by Downie and Comeau to the newfound physicality of Malkin's game, these Penguins stand up for one another and make life more difficult for their opponents. So, while it remains to be seen how much success the new look will bring, there's no denying these aren't the same Penguins of the last few years. And, to this point, it's hard to argue with the results. I think a lot of the credit for how well they are doing goes to their positive, winning attitude, along with the 40% overhaul of the roster which gives them some nice fresh blood. Plus they are skating SUPER fast! What a fun team to watch!The Boston Bruins are my team, but I am really enjoying watching your Pittsburgh Penguins this year! I hope to come see a Game at Consol before this Season ends.